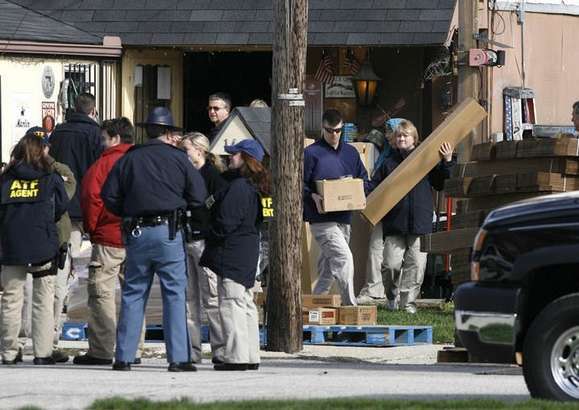 How Many ATF Agents Does It Take To Raid A Small Town Gun Shop? Ludco Gun Shop owner Fred Ludington was arrested this morning on federal charges. Ludington was charged with selling firearms to felons and non-Indiana residents. Damnit Fred! Didn’t you know that the ATF is already in that business? I wouldn’t take to kindly to someone cutting into my margins either. Thou Shalt Not Steal or Do shady things as the government hates the competition. Makes me glad i live in Texas. They just ‘assume’ we’re doin’ tha right thang lol. All I know is that I am going to buy stock in Royal Robbins 5.11. Looks like that is the preferred pant of the ATF. Let’s see 70 agents; so that would be 60 Supervisors and 10 workers. Sounds about right. Oh plus 1 Trooper for good measure. You know, in case things go sideways. Never thought you would remember the days of Ma Reno’s Justice department with fondness did you? Welcome to Holder’s and Cass Sunstein’s Department of Injustice. They could cut down on the manpower if they went down to the Home Depot and invested in a few hand trucks to cart that gear out. Additionally how many agents are required to shoot the breeze with local law enforcement? It looks like they have 4 agents talking to one state trooper. They will take the guns home with them and keep them for themselves.